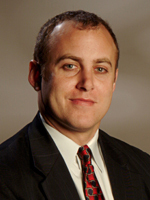 Always The Gentleman: WI State Rep. Gordon Hintz to female Republican "You are f'n dead"! It looks like the Wisconsin Assembly has its very own Charlie Sheen. State Rep. Gordon Hintz, the Democrat bad boy of Wisconsin, earned his stripes by getting arrested in connection to a prostitution sting and then grandstanding on the Assembly floor. In true Charlie Sheen fashion, Hintz shows he can be abusive to women too. 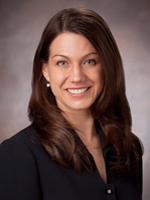 620 WTMJ: Last Friday.... after the Assembly voted to engross the Budget Repair Bill, Hintz turned to a female colleague, Rep. Michelle Litjens and said: "You are F***king dead!" An Oshkosh Assemblyman apologized to a colleague Monday for comments he made on the floor of the Assembly last week immediately following a vote on a contentious budget repair bill. Rep. Gordon Hintz, D Oshkosh , apologized to Rep. Michelle Litjens, R-Winneconne, for shouting out an obscenity that included the words “you’re dead” that Litjens and other witnesses heard in the chaotic scene after Republicans approved the bill. Litjens said she accepted the apology, but has asked the Assembly leadership to discipline Hintz. Litjens is a good sport for only asking for discipline. She really should seek a restraining order because a loose cannon like Hintz has shown he has no self control. How do crackpots like this guy get elected? 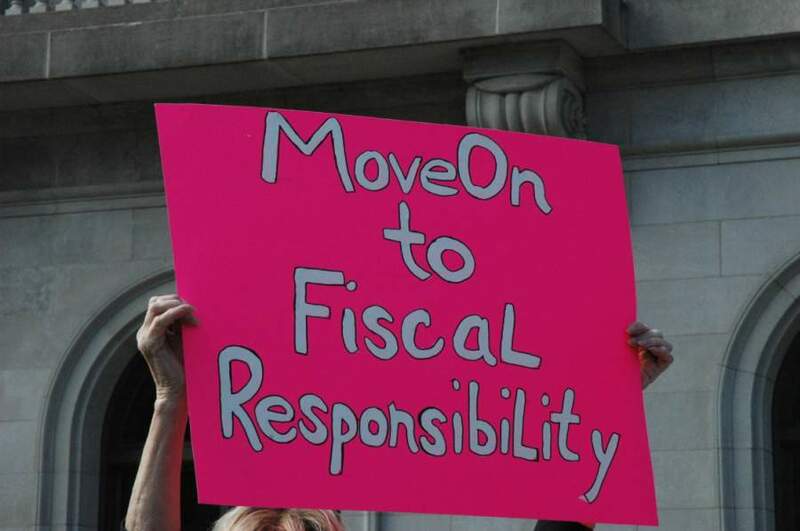 Wisconsin governor Scott Walker has given the AWOL Democrats (Fleebaggers) 24 hours to get back to Wisconsin, so they can vote on his proposal or risk missing a debt restructuring deadline. Call me a pessimist but I just don't see the Fleebaggers coming home for that. Keep in mind that these Democrats are very beholden to the unions. 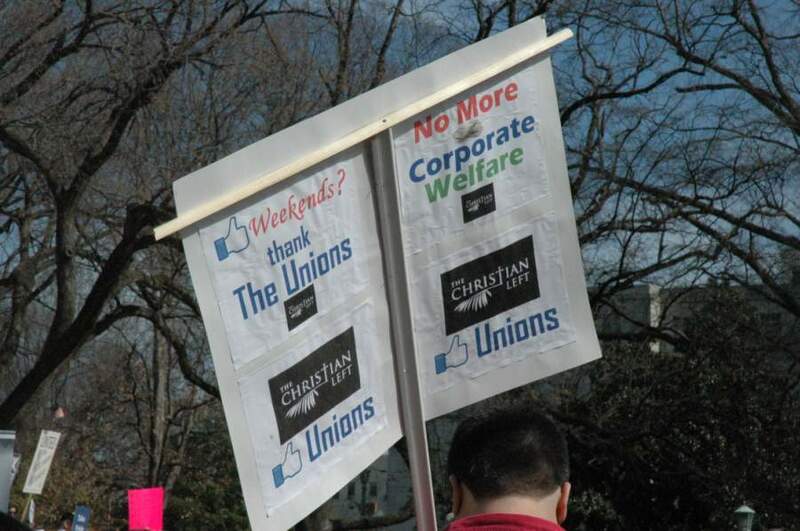 One fifth of the campaign contributions the Fleebaggers receive comes from unions. So, if unions are willing to accept give backs and layoffs instead of touching collective bargaining, then I cannot see how a missed deadline will motivate these Fleebaggers. If Public Policy Polling is correct, this long and drawn out standoff is taking a toll on Walker. I am sure the Fleebaggers are reading this poll as well and will be further motivated to stay away. Walker should have given this ultimatum on the first day the Fleebaggers fled and then pass the collective bargaining parts of the bill separately without the need for quorum. Once the collective bargaining parts were passed there would be little reason for the Fleebaggers to stay away. We will have to see how this all plays out, but I see don't see the Fleebaggers coming home. However, there are dangers for both parties, the poll indicates. A plurality of voters, 43 percent, would blame both Republicans and Democrats if the lights go out at midnight on March 5. Forty-five percent of respondents said neither party would benefit politically from a shutdown. I am rather surprised that the numbers are not stronger. Despite the endless comparisons to the 1995 shutdown, the situation is completely different today. Today, the nation is on the fast track to bankruptcy and many Americans know it. Thus, Democrats refusing almost any cuts makes them look highly irresponsible. Seeing so many Americans willing to blame both parties, tells me that Republicans have not done a good job telling Americans are true financial situation. Again we need an adult to step forward and tell the nation the truth ...We're Broke! Business Insider: This is the "income statement" of the United States in 2010. "Revenue" is on the left. "Expenses" are on the right. First, "Revenue" is tiny relative to "Expenses." Second, most of the expense is entitlement programs, not defense, education, or any of the other line items that most budget crusaders normally howl about. Third, as horrifying as these charts are, they don't even show the trends of these two pies: The "expense" pie is growing like gangbusters, driven by the explosive growth of the entitlement programs that no one in government even has the balls to talk about. "Revenue" is barely growing at all. This is the sad state of America;s economic affairs. I am sure our friends on the left will look at this chart and say we can easily balance the equation by raising taxes, especially corporate taxes which only account for 9% of the government's revenue. But here is the rub, when it come to raising taxes the law of physics apply; for every action there is an equal yet opposite reaction. Raise the corporate tax rate and corporations will do one of two things a) pass on the tax to consumers with higher prices or b) flee to countries with lower tax rates (and take their jobs with them). Try raising personal income tax and you end up with less revenue in other areas (e.g. cigarette and gas taxes) because individuals have less money to spend. Therefore, cutting spending becomes the logical thing to do. 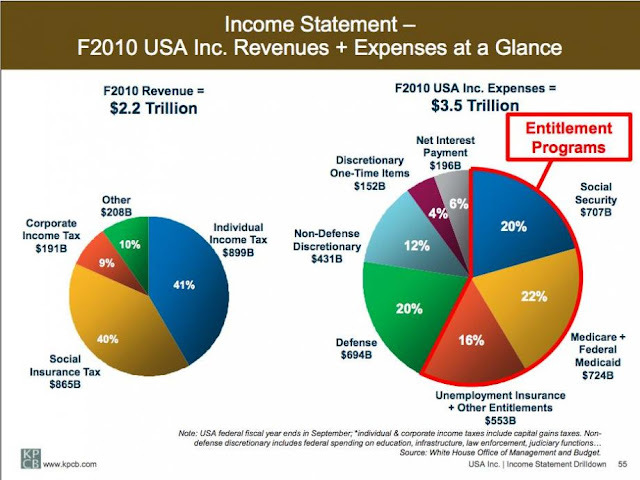 From the chart on the right it is clear that entitlements is where the real money is. Defense spending at 20% is nothing when compared to the combined 58% of entitlements. Add to the fact that entitlement are growing at a much more rapid rate than defense, entitlements becomes the focal point for spending cuts. The problem is that politicians have made entitlements into a sacred cow. The other problem is that too many politicians (both right and left) have used growing entitlements as an election tool. By promising all sorts of "free" goodies, like "free" healthcare for kids or "free" prescription drugs for seniors, politicians have been exasperating the problem. 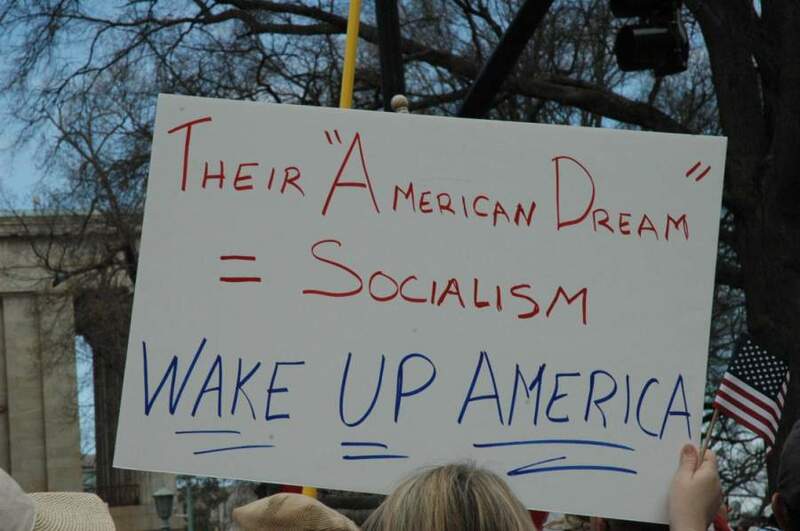 What is needed starting 2012 and forward, are politicians who have the guts to tell Americans that the "free" ride is over. 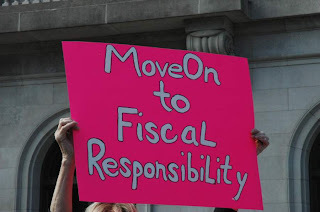 We need politicians who are adult enough to lay before us the stark choices to bring our financial house in order and that means a) start taxing more people (bye-bye progressive tax, hello flat tax), b) cut entitlements (good bye free rides) or c). a combination of both. I invite you to see where Business Insider got the chart from it is Mary Meeker's presentation of America's financial statements called USA, Inc.
CNN: Cain, a conservative talk show host and former Godfather's Pizza chief executive, won the American Policy Summit's presidential live straw poll on Sunday. Republican Rep. Ron Paul of Texas won the summit's online poll.The survey is a chance for conservative activists gathered on the last day of the Tea Party Patriots conference to name their favorite presidential picks. Following Cain in the live voting were: former Minnesota Republican governor Tim Pawlenty, with nearly 16 percent of the votes; Paul, with just over 15 percent; former Alaska Republican governor Sarah Palin, with just over 10 percent; former Massachusetts Republican governor Mitt Romney, with nearly 6.5 percent, and Minnesota Republican Rep. Michele Bachmann, with just over 5.6 percent. I am not surprised Cain won. Cain, Pawlenty and Paul were all in attendance and out of the three, Cain is by far the most charismatic. 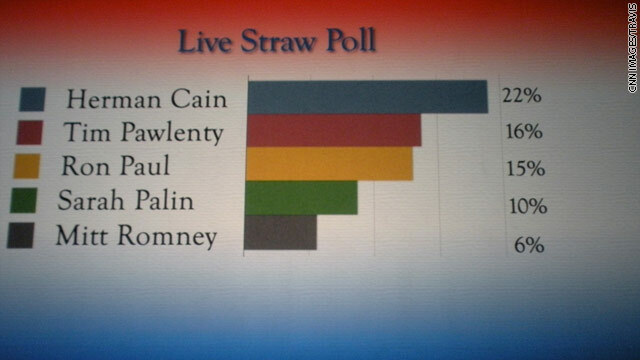 When the primaries get underway, Cain will certainly be one to watch. It will be fascinating watching bore snores like Mitt Romney and Tim Pawlenty trying to get attention with Herman Cain and Sarah Palin in the same arena. I also hope this win helps to raise his profile and name recognition. For those who missed Cain's remarks at the American Policy Summit, here is the video and for those interested in Pawlenty's remarks you can read them here. 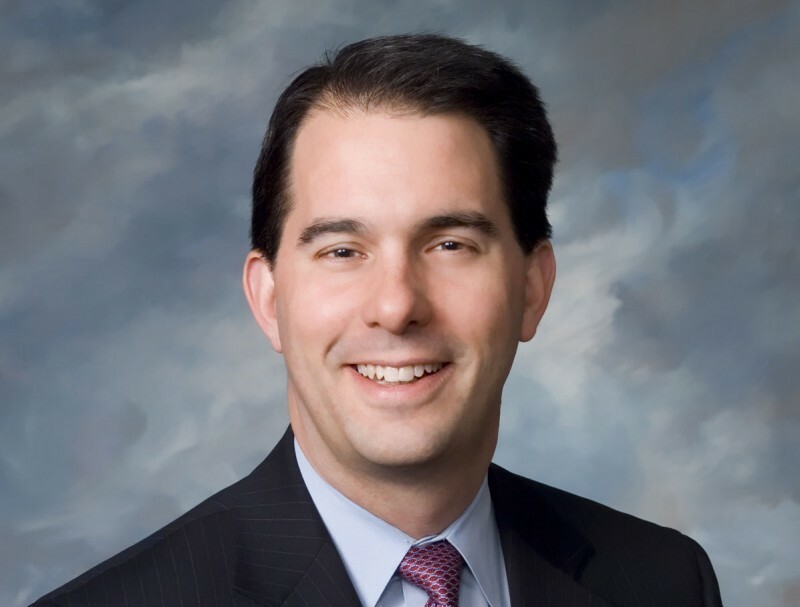 Politico: In an interview at the National Governors Association, the Republican praised Wisconsin Gov. Scott Walker and couched his own proposal in the language of liberty loved by tea partiers. "He's got a big challenge, and quite frankly, once they start reading our budget they're going to leave Wisconsin and come to Maine because we're going after right to work," LePage told POLITICO. "I believe that the Declaration of Independence says 'life, liberty and the pursuit of happiness,'" he said. "Whenever someone forces me to do something against my will, they're infringing upon my freedoms and my liberties. And that's what I think we're doing in Maine when we have fair share, which means that you are required to belong to a union, you're required to pay dues but you don't want to participate. I find that to be against everything the United States of America stands for." Good luck with that Governor LePage. Maine is still a very liberal state and the Republicans there might as well be Democrats. Unions will come down on LePage like a ton of bricks because he is focusing on one of the key ways unions retain power. I don't see much success for Maine becoming a Right-to-Work state, but if handled correctly the debate should be useful for the national conversation and to expose some of union's strong arm tactics. I had no idea Chris Matthews had a brother. Breitbart TV: Chicago played host to a union thug rally with plenty of lefty kooks screaming about the white-supremacist GOP. Could someone please give this guy a napkin! MoveOn.org and labor unions staged national protest today. They were successful at putting quite a few boots on the ground in Madison, WI, but elsewhere, eh. Legal Insurrection: Protests in support of Wisconsin public sector unions were organized by MoveOn.org and labor unions today. In Columbus, OH, where you would expect a big crowd given a similar controversy, only "several thousand" people protested. I am not surprised that the numbers failed to materialize. The reason why the left has trouble getting people to come out is because the left is comprised of grievance groups. There are minority groups, women's groups, gay groups, unions etc. Each group has their own grievance and it is hard to get them fired up over someone else's grievance (in this case unions). Despite the left's best efforts to paint union's grievances as the middle classes' grievances, it simply isn't true and everyone knows it. 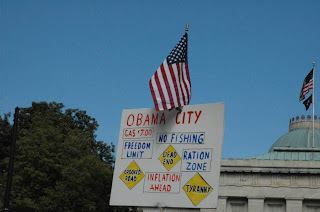 The TEA Parties on the other hand have an over arching theme of reigning in government. Under that theme, you will find all sorts of other conservative groups, neocons, social conservative, pro-lifers, etc. Unfortunately for the left, the over arching theme for all of their grievance groups would be "Gimme, Gimme, Gimme" and that would be absolutely unsightly to display in public. 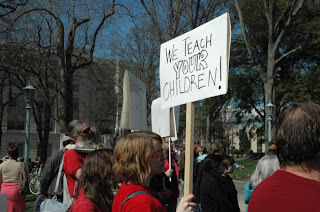 Below are some pictures from the protests in North Carolina sent to me by one of my readers. 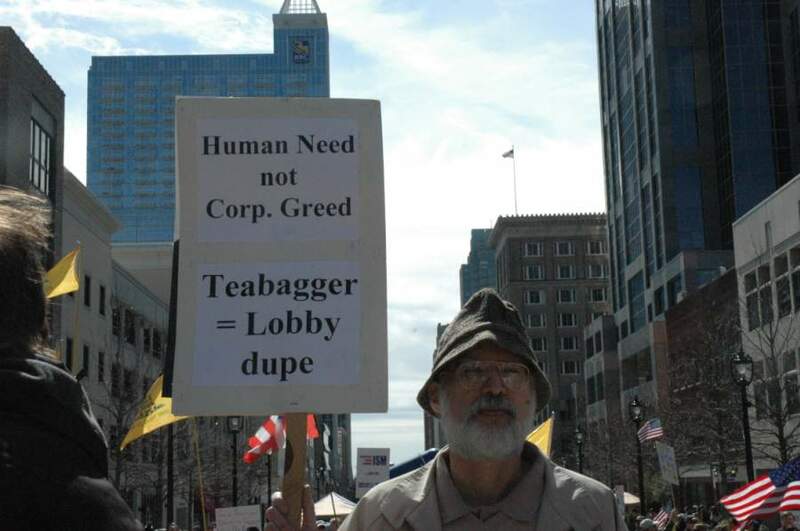 They include both the pro-union protesters and the TEA Party protesters (click to enlarge). Rockford's tourism board is wasting no time capitalizing on the Fleebagger craze. Now that is what I call capitalism! Labels: AWOL Dems, fleebaggers, Rockford Il. Remember the early days of the Obama administration and the parade of tax cheats and crooked politicians? Well, it seems like Rahm Emanuel has brought that habit with him back to Chicago. 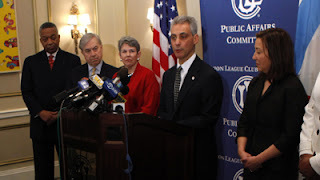 Chicago Tribune: A veteran politician Rahm Emanuel named to his mayoral transition team resigned her high-level state job last summer and paid a fine for conducting political business on state time, according to a newly filed ethics report. Judy Erwin, a co-chair of Emanuel's mayoral campaign, said late Friday night that she would resign her new post on his transition team after the Tribune contacted her and the campaign. She said she hadn't informed Emanuel of the ethics violation. Erwin, the former executive director of the Illinois Board of Higher Education, admitted using her office e-mail and phone while working on a campaign committee for presidential candidate Barack Obama, using staff resources to plan her trip to the 2008 Democratic National Convention and engaging in campaign fundraising activity while on the job, the state's Executive Ethics Commission ruled in a decision filed Feb. 16. The ethics commission said she cooperated with the investigation by the executive inspector general, reimbursed the state, agreed to pay a $4,000 fine and promised to never work for the state again. She resigned Aug. 15. That was a very short promise. If Chicago thought it was going to get real Hope and Change from Team Rahm, they are in for a rude awakening. Read the rest of the story for cozy nexus between Judy Erwin and the Obama administration. You all know that Clifton B loves watching the traffic at Another Black Conservative soar. I watch my Sitemeter like a hawk. Since I was forced to take some time off from my blogging, my site stats have been less than stellar and forget about getting on Memeorandum. In the words of Sam from The Last Tradition: Memeorandum is treating me like an ugly stepchild. However, there is a way to get my totals sky high again. 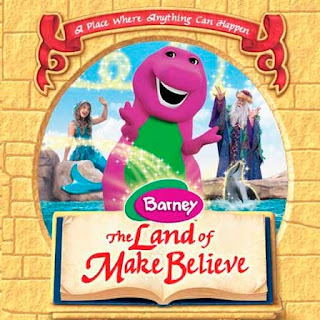 Simply make up a story that liberals will love. One blogger did exactly that and is now rocking the top thread on Memeorandum. This blogger concocted a story that Scott Walker was asked to leave a restaurant in Madison, WI. The lefties ate it up like it was Manna from Heaven! Unfortunately, a blogger decided to dig a little deeper and the story is looking like a complete hoax. Even though the story is false, this lefty blogger is still pulling in the traffic on Memeorandum. Like Troglopundit, I want my own thread on Memeorandum too. 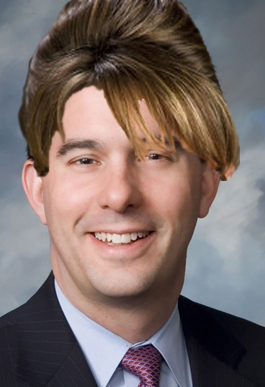 So here goes my false story of the day: Sarah Palin and Scott Walker have a secret love child, and here is the picture to prove it. Now give me the hits damn it! Sounds like Newt has been listening to Rush Limbaugh lately. Rush made the same analogy of how the left would react to President Palin the other day. That aside, the idea of impeaching Obama over not defending DOMA in court is nothing more than a pure fantasy. With a split Congress and weak knee Republicans all over the place, anything short of Obama giving all our nation's secrets to the Chinese will not lead to impeachment. I also find talk like this very distracting for 2012. Just like Obama's birth certificate and his religion, the impeachment issue only muddies the waters and fires up Obama's base. Obama is very beatable in 2012 for the simple fact that the nation simply cannot afford his wild and irresponsible spending. 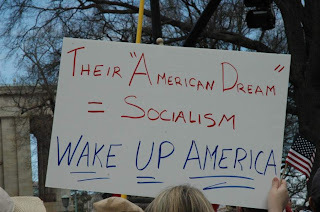 In 2012 all that is needed to defeat Obama is someone who can deliver this message crystal clear and then stand up to the blast furnace of hate the left is sure to project. Newt Gingrich is simply incapable of both. So, to those conservatives who might be swayed by Newt's impeachment talk, take Newt's own advice and shrug it off. Democrats are sounding very happy with the Republicans two week spending bill that includes $4 billion in microscopic spending cuts. ABC News: The GOP’s latest proposal – a two-week spending bill with $4 billion in cuts – was designed to be hard for Democrats to resist because it is full of cuts they had already supported. For instance, the Republicans’ plan included $1.24 billion in cuts proposed by President Obama in his 2012 budget and about $2.7 billion in cuts to earmarks that both parties have already renounced. The House will come back into session on Monday and is expected to complete debate and vote on the two-week extension on Tuesday. Boehner predicted they would pass it in short order and called on Senate Democrats to follow suit. “Once the House passes our second continuing resolution early next week, I’m hopeful Senator Reid will quickly hold a vote on our short-term proposal so we can ensure the government remains open and that we’re addressing the need to cut spending to create a better environment for job growth,” Boehner, R-Ohio, said. 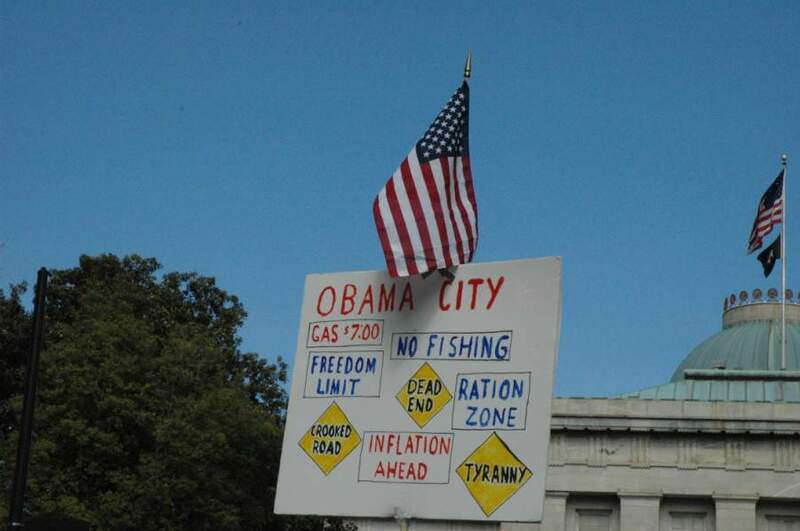 First, I hope TEA Party Republicans throw a monkey wrench into this foolish and unnecessary plan. Second, of course Democrats love the idea. 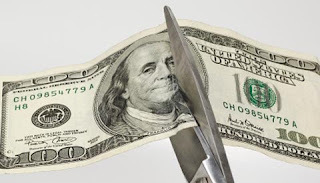 It includes all the the cuts they wanted and they will act like the $4 billion cut is a $4 trillion cut, then two weeks later we will be right back to where we were with the $61 billion cuts. The words "We're broke" should have been falling out of every Republican's lips from November 3rd. Had they done that, Democrats' foot dragging on cutting spending would look like the dangerously irresponsible behavior it is. Republicans need to stop being fearful about a government shutdown. This is not 1995. 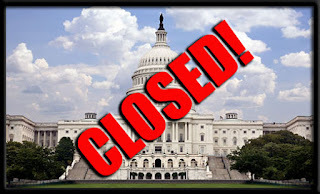 Conservatives have resources to break through the media filter and explain that during a government shutdown, the government doesn't really shutdown. Too bad Scott Walker and Chris Christie cannot give testosterone injections to the Republican leadership. See what others are saying about this plan on Memeorandum. 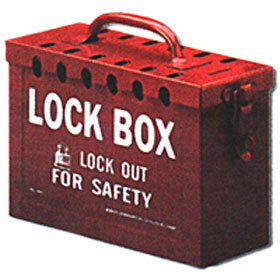 Continuing on their path of irresponsibility, Senate Democrats want to resurrect another old and failed idea for Social Security ... Al Gore's Lockbox. The Hill: Senate Democrats want to put the Social Security trust fund in a lockbox and insulate it from a broader budget-cutting package designed to reduce the national deficit. Leading Senate Democrats say Social Security reform should not be part of a deficit reduction package under negotiation. Senate Budget Committee Chairman Kent Conrad (D-N.D.), who is at the center of bipartisan talks, said he wants to prolong the solvency of Social Security to 75 years. Under its current setup, the program is projected to pay 100 percent of benefits for the next 26 years. This isn't serious thinking. Spendthrift Congress members are expert lock pickers and have raided Social Security funds in the past. Nothing about this proposal would stop it in the future. Furthermore, trying to balance our budget without addressing Social Security is a fantasy. Everyone knows that Social Security is one of the big three items blowing a whole in our budget. It simply cannot be left out of the equation. The left love to accuse Republicans of being the party of No Ideas, yet time and time again, Democrats prove themselves to be the Party of Failed Old Ideas. 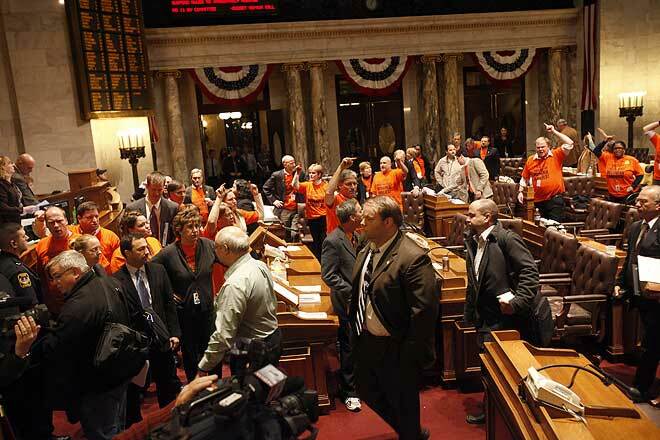 Journal Sentinel: Madison - After a bitter, 61-hour debate that was the longest in living memory, the sleep-starved state Assembly voted in just seconds early Friday to approve a watershed proposal repealing most union bargaining rights held by public workers. Despite using every official trick in the book, the Democrats in Wisconsin's Assembly could not stop the inevitable. This is why the Fleebaggers fled. Had the Senate gone first like normal, the Assembly would have pass the bill in little time. Too little time to create the media circus we have seen unfold. Now the pressure is on the Senate to for at least one Fleebagger to return. 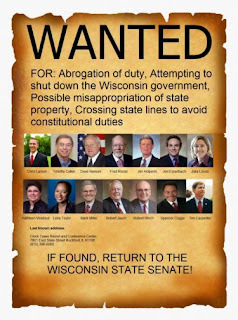 Given the high level of voters who disapprove of the Fleebaggers actions, it appears the Fleebaggers would get the blame for job losses should Walker's bill not pass. Stay tuned. 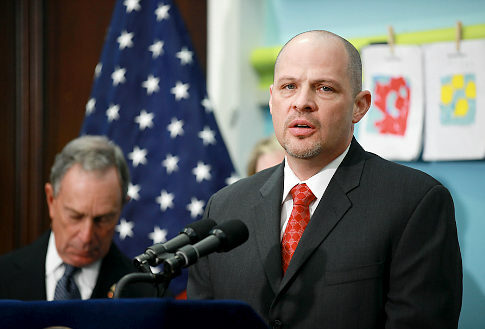 Question: With 5,000 city teachers facing possible layoff, what do you thing the United Federation of Teachers (UFT) would do? Answer: Party like it is 1999, of course! 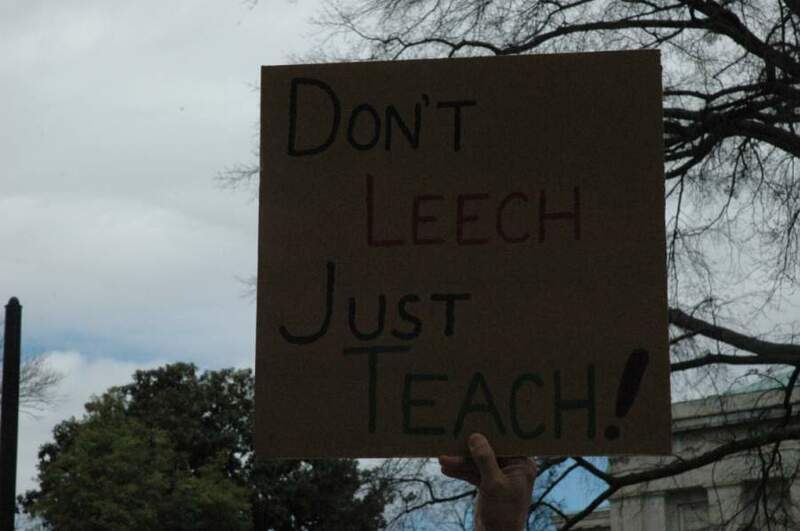 New York Daily News: As nearly 5,000 city teachers face the ax, their union shells out millions of dollars on feasting, boozing and partying, the Daily News has learned. Ponied up $514,000 to 16 separate caterers. Dropped $278,417 on the annual Teachers Union Day ceremony at the Waldorf-Astoria. Bought $6,100 in gift baskets from a lower East Side candy store - and plowed $179,000 into training retreats at a Connecticut resort boasting golf, scuba diving and aqua aerobics. 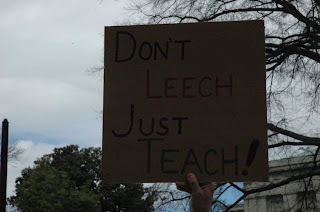 Funny how all you hear about in NYC is how the teachers have no money, yet here is their union throwing lavish parties at the Waldorf_Astoria! Perhaps these teachers would have a little more money if they weren't blowing big bucks on union dues. Rasmussen latest polls deals with the standoff in Wisconsin. The poll finds that while voters are split over public sector unions and Scott Walker, they clearly dislike the Fleebagger tactic. 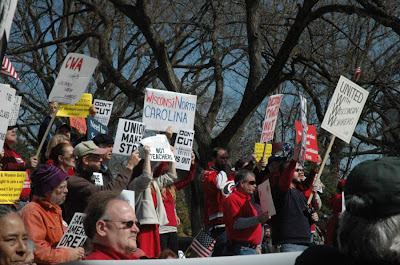 Rasmussen: Half of America’s voters favor public sector unions for government workers, but they strongly oppose the tactic by Wisconsin state senators to flee their state to prevent a vote that would limit the rights of such unions. Forty-seven percent (47%) of voters nationwide now support Walker, virtually unchanged from earlier this week. Forty-two percent (42%) support the unions for teachers and other state employees in the standoff, up from 38% in the previous survey. Eleven percent (11%) remain undecided. Seventy-five percent (75%) of Republicans and 53% of voters not affiliated with either of the major political parties agree with the governor. Seventy-nine percent (79%) of Democrats side with the union workers. I think if the standoff in Wisconsin goes wrong, these numbers will move one way or the other depending on who looks like the bad guy. 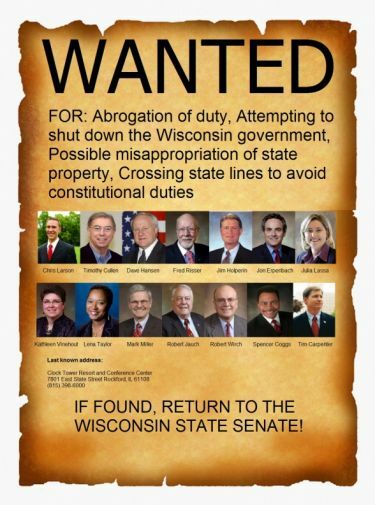 If Walker allows this to drag out very long he may come up the loser. On the other hand, if unions continue to escalate their aggression, they could end up the losers. The clear losers are the Fleebaggers. I wish Rasmussen would have asked folks why they disapprove. Is it because it looks like they are sore losers or is it because they are shirking their responsibilities. I would love to know. Click over to Rasmussen to see the rest of the results, they are quite interesting.